Last week, my misidentification of a laser engraving on a space part suggested the wrong personality core from Portal 2 was symbolically being flown to space (a fate echoing the game's story.) 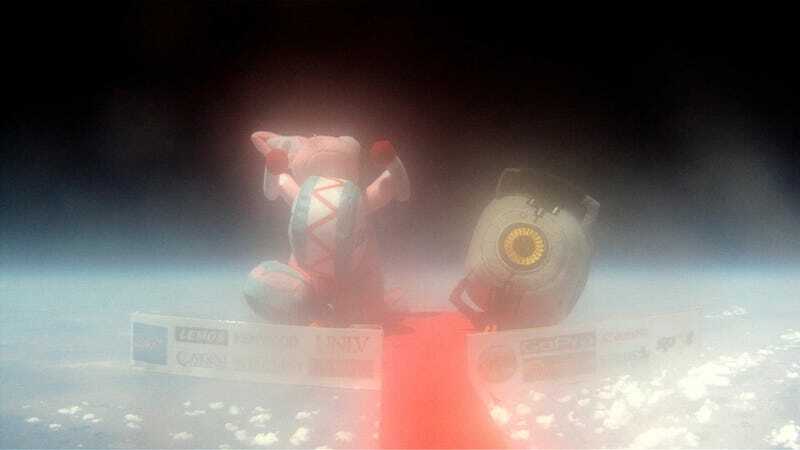 A team of 18 teenagers from Nevada stepped in to restore order, and properly send the Space Core—or, well, a plushy version of him, anyway—to near space. That image above is of Space Core (and an Energizer Bunny) at about 91,000 feet, which were launched yesterday by the University of Nevada-Las Vegas' Summer Advanced Gifted Education Academy—aka smart kids. One, named Jake, enrolled in a class called "Project: Space!" whose goal was to send up two weather balloons. "In the first week, I found out that the majority of the class were huge Portal and Portal 2 fans when we sung both 'Still Alive' and 'Want You Gone' from memory," Jake writes. "After much preparation and anxiety, we sent up the weather balloon [Saturday] morning and retrieved it in the afternoon," Jake wrote. "The balloon ended up going up about 91,000 feet (we could have done better, but the wind decided to make our lives harder)." The photo above is blurry because the balloon's camera lens still was fogged by a cloud it had passed through. The image is of the balloon just before it burst. "Lots of things have been sent into space before, but I think this is the first time a space core was sent up," he noted in conclusion. Indeed. The project team, Flying Apple Space Technologies (so named because Newton's fell to Earth, theirs is going in the opposite direction) is working on uploading a full video of the Space Core's flight. They also have another launch coming up and are keen to find supporters so that they can send up more scientific instruments. Previous launches by the SAGE Academy have included Geiger counters, weather loggers and a flight predictor.